Eastleigh Lakeside Steam Railway is a popular attraction near to Southampton, perfect for a day out with the kids at the weekend or during school holidays. Our steam trains run from the main station at Eastleigh Parkway to Monks Brook Halt, offering the opportunity to visit the lakes, children’s playground and use the picnic tables for refreshments. 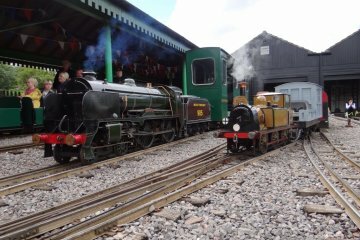 The steam train returns back to the main station from Monks Brook Halt, with the entire trip totalling 15-20 minutes. Our souvenir shop stocks the full range of Thomas and Bigjigs models for budding steam train enthusiasts! 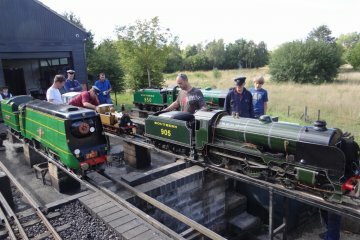 We believe we have the largest collection of Miniature locomotives on a commercial railway, with a total of 23 in the collection; 20 being steam powered and most of them are in steam on gala days.